The Robertson-attack-former-employees "game" is finally over. How did the score end up? As many of you know, back in 2007, Michael Robertson accused several former Linspire employees of embezzlement and other ridiculous charges. This all came from a dispute between myself and Robertson over how to treat employees who were needing to be laid off, given a shift in the company's direction. Greedy Robertson originally wanted to give these long-term, dedicated employees a pathetic two weeks severance (apparently knowing he would be taking all the remaining cash from Linspire soon and wanting as much there as possible), but I wanted to see them treated more fairly. When as CEO, I awarded the severance I felt was fair, Robertons went on his insane attacks, calling us all thieves, conspirators, etc., and making these same false claims to his bank and insurance company. All along, Robertson told others that he was anxious for his day in court and for the truth to come out. A year ago he stated, "There will be a trial later this year where their [employees] actions will become public. I'm looking forward to it because I'm proud of my actions..." Every time he'd lose another round in court, he could argue that it wasn't over yet, and to just wait and see. Well, it's now over. All the trials and verdicts are in. I've chronicled the blow-by-blow of this over the past years in my blog, but it may have been complicated to have followed all the outcomes along the way. So, now that it's over, I thought I'd summarize how it all played out and share the final "score." If everything Robertson accused these employees of had been true, they should all be in jail right now, and they certainly wouldn't have profited from the actions they took. So, how did things turn out? The bottom line is if the employees had just walked away and accepted the two-weeks of severance Robertson originally wanted to pay them, they would be $217,000 worse off, even taking into account the legal fees they had to waste in defending themselves against Robertson's mad-man attacks**. As for Robertson, had he just accepted the severance the CEO had awarded these employees, he would be $644,000 better off financially, roughly how much money he lost unsuccessfully attacking these employees. So, what did Robertson get for his $644,000? He showed the world what a greedy person and unscrupulous bully he is. He showed how dishonest he is. Had what he said been true, these employees should be in jail, and certainly not $217,000 better off. He inspired and brought attention to the Freespire.com website to make sure the world will forever know what he's really like. He wasted countless hours with his lawyers and in the courtroom, suffering costly and embarrassing losses again and again, time that could have been spent running his seemingly anemic businesses. He helped make his lawyers rich. He was called out for possible fraud by his bank. He is being investigated for possible insurance fraud, a criminal offense for which one can serve jail time if found guilty. He put a spotlight on the fact that after nearly FOUR YEARS, he still has not made an accounting to the 100 or so Linspire shareholders as to the millions of dollars that went missing. Don't you wish you had $644,000 to waste like that? But, we all know what they say about a fool and his money. Keep in mind that Robertson originally wanted the CFO to only get two weeks of severance, so the CFO still ended up much better off, even with the $81,333 awarded. Judge Taylor also pointed out that the CFO was actually due TWO years of severance, but in the spirit of cooperation, the CFO had agreed to take less when he was terminated. Evidence came out at trial that the CFO reported directly to me as CEO and that he was under contract from his Employment Agreement to do so. At the time I laid him off, I had given him specific, written instructions to "stay out of the middle of this and allow me to communicate this with Robertson," so any reasonable person could understand why he didn't inform Robertson that he had just been laid off by the CEO. Robertson said he was "proud" of his actions. That should tell everyone all they need to know about Michael Robertson. Because I took no severance for myself when I resigned from Linspire, I ended up about 80K in the hole defending Robertson's attacks (my share of legal fees and damages), but it was worth it to stick up for the employees who were being attacked. I'm much more "proud" of having spent $80K helping defend these good employees, than Robertson should be with the $644K he spent falsely attacking them. 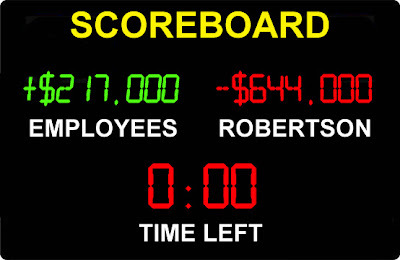 The next time Michael Robertson tries to spread lies about these former employees, or anyone else for that matter, please refer them to the final scoreboard. No matter how he tries to spin things, the bottom line is the employees won $217K and he lost $644K. So yes, the truth has finally come out and now everyone knows what those of us involved have known all along, that Robertson is a greedy, unethical, ruthless bully...and a loser. 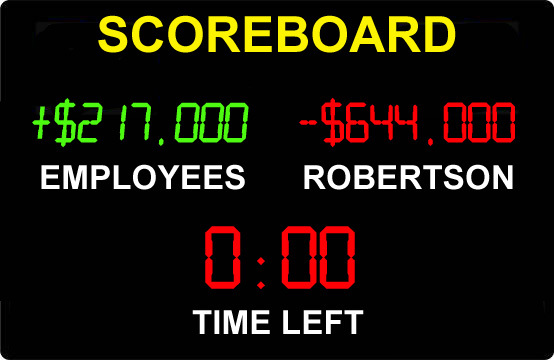 *Employee Calculation: Severance awarded to employees by CEO of $466K, less the amount Robertson originally wanted to see these employees get in severance of $29K, less $220K in legal fees and damages suffered by the employees = +$217K. Robertson Calculation: From court documents showing $426K in legal fees spent by Robertson in the Linspire, Comerica and Federal actions, plus an estimated $100K for the Freespire action, plus $238K awarded the Controller in legal fees, less $120K damage/legal fees awarded = -$644K. **Like the Controller who was awarded his attorney fees, the other employees could have also sued Robertson for their legal costs, and most would have probably been awarded a judgement for those fees, but they didn't bother, knowing how unethical Roberson is and that even with a judgement, they may have never been able to recover anything from him. UPDATE: Judge Taylor even ended up vacating and setting aside the small judgement against the CEO and CFO. Read details here. Normally I set my predictions after the first performance night of the Top 12, but since this season they had 13 in the top group, I decided to do it before the Top 12 perform, since we all got to see them perform last week. Here are my predictions for this year. As always, I'm not saying these are my PERSONAL favorites, but just how I think America will end up voting. (Casey, Pia, and Thia are my personal favs.) To hear how each of these artists sounds, you can click their photos and sample 90 seconds of their songs from last week via iTunes. Click to sample their performances last week. prediction as first to be voted off. To make it easy to email or post your predictions, here are the contestant's names in text form, so you can easily cut, paste and move them around in the order you predict. Let's see who has the golden ears and can spot what America likes. SCORING POINT SYSTEM: Every week, you get 1 point for every number off you were for where someone would be voted off. For example, if you predict Casey will make it to #2, but he gets voted off #4, then you get 2 points. If you guess it smack on, you get no points. Like Golf, the LOWEST SCORE WINS. PENALTY POINTS FOR LATE ENTRANTS: All predictions must be in BEFORE the performances this Wednesday night (March 16th). If you're predictions come in after that time, you are penalized 4 points OR the maximum points anyone else was off for the first round (when they vote off #12), whichever is higher. If you miss the first two rounds, you are penalized 8 points OR the maximum points anyone else was off for the second round (when they vote off #11), whichever is higher. No more entries after the first two rounds and we are down to 10 contestants.